Hollywood is waist deep in reboots these days. Comic books were feeling a little bit left out, so Dark Horse Comics has decided to get in the game, rebooting their Aliens, Predator, and Alien vs. Predator titles. And what the hell, they’re going to throw Prometheus into the mix as well. News of these titles hit a little while back—except for Prometheus, that’s a new addition—but now they’ve released a new teaser for their upcoming remixes. 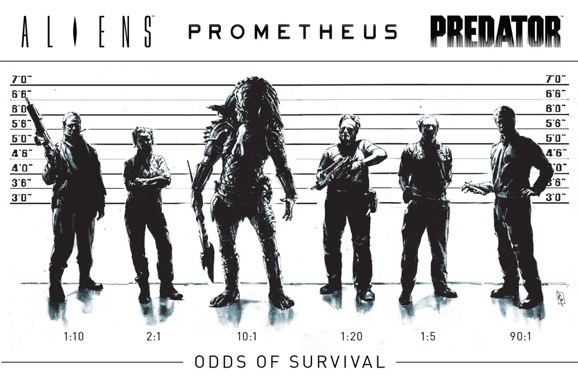 This faux-police line up, which plays like a scarier version of the one in The Usual Suspects, features a collection of humans, surrounding the Predator himself, all with their odds of survival. I don’t know what these odds makers know, but the 10 to 1 on Predator seems a bit off, especially when a normal looking dude is pulling 90 to 1. Then again, I don’t know any of these people, maybe he’s the ultimate space badass. None of these people look familiar, which seems to support the claims that the action in each series will deal with new characters and situations. After all, why reboot a property in the first place if you’re not going to try to do something different with it? There’s also a wide range of types. You get a little military action, as well as some civilians, and some look futuristic, while others are more modern in appearance. This last piece gives you the impression that the storylines cold take place across multiple timelines, or at least in multiple different eras. We’ll have to wait and see if any of this is true, but that’s the feeling I get. The four series will be set in a shared universe, which makes sense because the films they’re all based on take place in a shared cinematic universe. The sources are set at different points in time, so it will be interesting to see how much interplay there is between stories. Titles set in the future could reference events from earlier timelines; or you could see the embryonic beginnings of things in one plot, and witness them come to fruition in another. This sort of interconnectedness could be used to do some cool things, crossing over without necessarily doing it in a traditional comic book fashion. Dark Horse hasn’t set a release date for their new books yet, but the creative teams are in place. Christ Roberson and Patric Reynolds will collaborate on Aliens, Chris Sebela will handle the Aliens vs. Predator, while Joshua Williamson will tackle Predator, and Paul Tobin will work on Prometheus.